Editor’s note: This is a set of stories based on facts shared by our spirit friends at Timestream, including “The Seven” ethereals, through various ITC contacts… how they view our world to get a bearing of our position in time and physical space. I’m sure my interpretation here is over-simplified, but hopefully it’s close enough to afford us a better view of how they see our material realm from their timeless perspective, and the challenges they face in locating us. Having a roadmap can help us on our journey as we read the various stories. 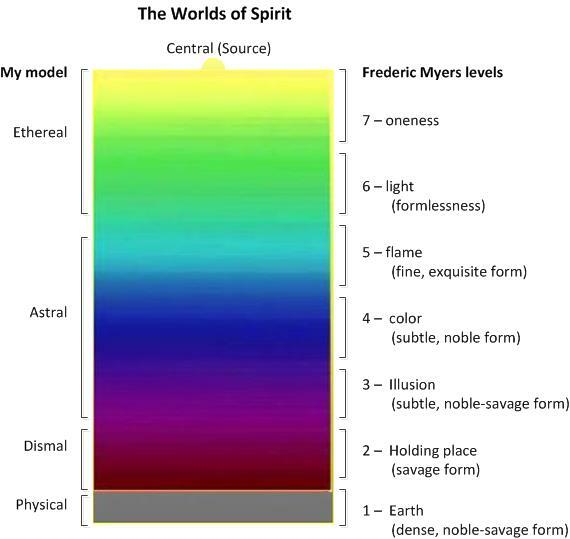 This is a view of the spirit worlds from my perspective, and from the perspective of Frederic Myers. So here I am, an ethereal being observing millions of years of Earth history… farther removed from you humans than you are from insects with lifespans measured in moments. From here, time in your world looks something like a river. … meandering with some uncertainty through the woods toward various fields of possibility. Stepping back for a broader perspective, we can see your world at critical moments in history, branching off into tributaries that you would call parallel worlds. Parallel worlds may seem like science fiction to many of you, as you observe life from just one of those worlds… but we can see them all clearly, like rivers flowing in the same general direction. For instance, there is another Earth flourishing in a parallel universe in which Adolf Hitler never came to power in Germany, and world society is currently evolving on that planet differently than on yours. Someday you might be able to communicate and collaborate with your human counterparts in the various parallel physical worlds of your Earth. You have already begun such interactions with nonphysical beings such as us and with our mutual friends in the astral worlds. You have done this through ITC. As your science evolves to embrace the living beings flourishing at many dimensional levels that are currently invisible to your scientists, then time and space will lose much of its illusory nature. Many of the individual tributaries of human evolution will come together into the greater ocean of life that awaits you all. Many of us anticipate that inevitable reunion with the Earth and its parallel worlds, especially those “departed” humans now residing in the astral afterlife worlds who choose to foster heart connections with their loved ones still alive on Earth. The astral realm contains countless worlds and communities of subtle form. We at the finer astral realms, especially at the fifth level, move fluidly between form and formlessness. We can have exquisite human bodies that glisten with life, or we can immerse ourselves in pure love and consciousness to transcend structure altogether. The drama of Earth is long forgotten. Dissonance and conflict are alien notions here. While you’re alive on Earth, you rarely get a glimpse of our realm, even in your dreams, as it is so far removed from your daily reality. Most of your spiritual interactions are with the denser astral realms… below. So here I am, an astral being. I’ve just completed another lifetime on Earth, “died” recently, and now find myself getting settled into a paradise community here on the “third human level,” sometimes called the mid-astral plane. I’ve joined the Timestream spirit group, which is dedicated to opening ITC communication bridges with you on Earth. Not an easy task!… let me explain. One of the more difficult adjustments I have to make in my new life is to observe time just passing here in a world that changes little. Nearly all of us remain at the prime of life in the peak of health, with perfect bodies. The flowers and trees that bring beauty and majesty to our world have flourished here as long as anyone can remember. They don’t wither and die… and they seem to have a living rapport with the sandy soil that prevents the encroachment of weeds. There’s no competition here among the people or the animals or the plants; harmony is a way of life. When I observe my loved ones on Earth (we have equipment here to help us “down-modulate” into denser bodies in order to get closer to your world and to see things there more clearly), time seems like a bodily substance. (Very strange!) Your bodies seem to morph in the process of aging… bound as you are to the illusion of time. We sometimes decide to take a step closer and actually visit you on Earth. We might “drop by” the house where we’d spent so many happy years in lifetime. This is especially true of people like me who recently died and are drawn to our grieving family members. We also feel a “pull” to that comfortable home with all of its familiar furnishings. During these trips, we can see you but you, typically, cannot see us. My new friends here, who are involved in various ITC projects, take similar trips to the homes and labs of the researchers on Earth with whom they’ve fostered a close working friendship. They set up their light, spiritual equipment right alongside your dense radios, computers, and other equipment… all invisible to you, of course. These trips into your world are almost always facilitated by ethereal beings (and occasionally with the modulating equipment I mentioned earlier), as it’s easy for us in the astral worlds to “get lost” when we start traveling among vibratory levels. It involves concentration and knowledge beyond our mental faculties… so our safe travels depend on the permission and assistance of those we sometimes call the “Rainbow people.” They can either observe and facilitate our journeys through the modulating equipment (in which case they forge a tunnel that pulses in rainbow colors and through which we travel to a particular time and location in your word), or they can actually accompany us on our journeys. In the latter case, blessed be the researchers, whose homes and labs are instantly filled with love and light the moment we arrive! I’ve heard a lot of strange stories from my colleagues here about these journeys… and the challenges they’ve faced in pinpointing the desired time and location. In one case, the team wanted to console a grieving researcher on Earth sitting beside her father, who was dying in a hospital bed. The team emerged from a tunnel in a parallel world of Earth, in which the researcher had a different shade of hair and body type. It was the same woman, the same father, and the same hospital… but the wrong world! They had to re-enter the tunnel and try again… and again… until they found the right time and location. While the ethereals can see a broad overview of the river of time and its vast expanse, we in the astral worlds can see only a small portion of the river… that is, the section of the river where you happen to be. We can see a little downstream (into the past) and maybe a bit upstream (into the future)… but the larger river with its many tributaries is beyond our view. We’re more up-close and intimate with your flow of time than the ethereals are, though we’re not a part of it. We can see the rough rapids… times of fear, animosity and conflict in your lives. We can see the smooth, gentle currents in times of peace and contentment in your world. When we immerse ourselves into the flow of time to get close to your world, our spirit bodies take on a density and we begin to feel some of the roller-coaster emotions that we’d experienced during our lifetimes… the feelings that you take for granted as a part of “being human.” To us it’s an unsettling sensation, and we always look forward to our return home to a finer world of spirit… a world of harmony. The more savage animals of Earth—predators—have no place in this astral world. All manner of cats and dogs with luxurious furs arrive here… but most of them tame and adapt quickly. Those with stubborn predatory instincts soon find themselves moving away… toward darker realms. That’s true of people, too, of course. Those who arrive here with savage inclinations, deeply ingrained by a lifetime of violence or greed or racial hatred or carnal craving, soon find themselves unable to find peace here… and they migrate rather quickly to the darker fringes of our world and beyond… into a more dismal realm where drama is a way of life… so aptly depicted in the movie Nosso Lar, or Astral City. So here I am, a dismal being, caught up in drama. People around me are chasing or being chased… dominating or being dominated… humiliating or being humiliated… punishing or being punished… suffering… languishing… consumed by guilt or shame or desire or anger or hatred…. It’s a timeless existence. It’s not the “eternal damnation” that some of you envision while living on Earth, trapped as you are in the illusion of time. Some of us have been here for centuries of your time, and others have been here only a few days… but the time difference is hardly noticeable. It is simply our reality, and although it feels rather permanent, we all know at some level that it’s really not. There’s always a way out… a way back to the light. It’s just a matter of being ready to find peace… and most of us, for whatever reason, are not yet ready. Most of us have bodies with imperfections—stubbled faces, scruffy appearance, dark circles under the eyes, obese or gaunt…. This dismal world is a vast community of those rather foul supporters of Earth’s most painful dramas. Let’s look at a cross-section of people at this level to give you an idea of what our lives are like. These are reports by your ITC researchers, so they describe not only our lives, but also our impact on your lives. Who can forget a couple of cases reported in Germany in the 1980s? The “Chopper case” involves a dentist (Dr Bachseitz) and his pretty, young, sensitive dental assistant, Claudia Judenmann. The rasping, guttural voice of one of my dismal compatriots, a man in spirit calling himself “Chopper,” was emitted from the sinks and toilet bowls in the dentist’s office. The voice was often so loud that patients fled the office and passersby were terrified. Chopper’s voice sometimes broke into telephone conversations or impinged itself silently on Claudia’s mind with sexual requests, promises, tasteless jokes, and obscenities. Being a sensitive young woman, Claudia would at time be influenced, nearly possessed by Chopper… to the point that some people blamed her for all of the mischief. Poor girl. I don’t know about Chopper’s lifetime, or why he wound up here in our dismal world, but he was probably someone who was associated with the building during lifetime and doesn’t realize that he died. Read more about the Chopper case here… and here…. At the denser levels of the astral world, where it begins to blend into darkness, are various groups and communities who enjoy excursions into the gloom, attracted by drama, sometimes seeking crude pleasures from stirring up lives on Earth. Timestream spirit group, whose ITC contacts were respectful, insightful, and inspiring, resides in the same general astral world as the other groups (2109, FDL, and the Majo group) whose messages are often troubling. They all inhabit the third astral level, where dispositions are much like our dispositions here on Earth—noble-savage in nature. We resonate with the third level, and that resonance makes ITC possible. The difference between the groups and their messages, I believe, is that Timestream is closely associated with The Seven ethereals, who provide support, refinement, and protection for the ITC bridge. They’re in frequent meetings with the Timestream group to determine what may and may not be shared with us on Earth. The other spirit groups simply share information with us however they’re compelled by their (and our) noble-savage dispositions. For the sake of world peace, social stability, and mental well-being, ethereal intercession should probably be a key part of any ITC bridges established in the future. Without ethereal support, ITC will cause chaos by stirring up the savage elements of our human nature. I woke up recently with an image or vision of a vast network of people in spirit (mostly at the third level but also from various other realms) and a growing network of people on Earth associated with our INIT group (International Network for Instrumental Transcommunication). Above that vast multidimensional network were The Seven ethereals streaming light and finer spiritual energies throughout the network. That ethereal energy coursing through the network is what stabilized, powered, and strengthened the ITC bridge between INIT and Timestream. The ethereal light flowed through all of the members of INIT and Timestream, purifying the disposition and personality of each member who was receptive. That is the image I woke up with recently, and it’s the scenario that unfolded for our INIT group for about five years starting in 1995. It could have continued indefinitely, providing our world with a stable connection for unimaginable understanding, wisdom, and love to stream into our world throughout this century. What went wrong, apparently, was a series of personality conflicts that stirred up doubts, animosities, and fears to the point that our INIT group became unresponsive to the ethereal light… and the bridge broke down… as I described in Miracles in the Storm. Thank you for all your hard work promoting universal harmony! The ‘view of the river’ comparison actually seems to be the best way of illustrating how these different vibrational entities (both ethereal & astral…I wonder how the dismal realm measures up..) view our world in terms of time and space, in my opinion! I was wondering if you or any of your readers had, by chance, heard of Lightbearers Worldwide? It’s an ‘Aquarian Ecumenical’ group that seems to be based in Montana. I always view these groups with a skeptical eye, but I think that they have very warm, loving intentions. When they describe themselves, they appear to acknowledge that every major religion and spiritual path is very relevant in the larger picture. They have many beautiful websites. They also talk about ascended beings, or ‘masters’, and etheric retreats. I find their different ‘spheres’ interesting – such as their violet sphere. They speak of the “violet flame”. I haven’t heard of the lightbearers group, but visited their website this morning. Sounds like they do good work. Could there be a universe in which the Edenites perhaps never destroyed their world through excessive technology? Could there be a reality in which INIT still continues to operate and experience incredible miracles from spirit colleagues, building an ever-stronger bridge and leading our world in the right direction? Right, Earth’s parallel worlds reside in universes that are parallel to ours. That’s good food for thought (whether Marduk still exists and INIT continues to operate in the parallel universes). Your guess is as good as mine on these possibilities.